Providing the solution to connecting everything is the Buffalo AirStation 1300 Gigabit Dual Band Media Bridge, which is good, since getting every device connected in a digital home or connected office isn't easy. Every new device seemingly comes with integrated Wi-Fi, with even TVs or Blu-Ray players offering at least an Ethernet port, but how to take advantage of these latest standards? Enter the age of the wireless bridge. 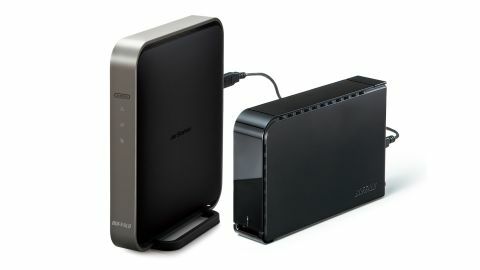 Products such as the Buffalo AirStation 1300 Gigabit Dual Band Media Bridge (also known as the Buffalo WLI-H4-D1300) and Asus RT-N66U provide a way of extending a wireless internet network to otherwise incompatible or Wi-Fi-lacking devices. All of that isn't anything too spectacular in itself, but the big thing to note for this Buffalo AirStation 1300 Gigabit Dual Band Media Bridge are its 802.11ac capabilities. This enables it to connect with the Buffalo AirStation 1750, which was the first available 802.11ac router on the market. In theory this should give a hypersonic transfer speed or whatever the network-equivalent superlative is. Considering at the time of writing there are no actual 802.11ac laptop adaptors available, or indeed any other devices, this makes it rather essential to be able to make anything of 802.11ac other than a nice shiny sticker on the side of the box. For those not in the know, it's effectively 5GHz 802.11n running over a 3x3 antenna array, so delivering three 433Mbps spatial streams with 80MHz channels, combining for a maximum of 1.3Gbps throughput. That contrasts with the existing best that 802.11n can muster of three 150Mbps streams, with 40MHz channels combining for a maximum 450Mbps. Since this Buffalo AirStation 1300 Gigabit Dual Band Media Bridge isn't designed to be a full router but more an intermediary connection, it'll only connect at 2.4GHz or 5GHz, depending on your installation. So it should still be of interest to everyone wanting to extend or bridge devices on their network. On the face of it, the Buffalo AirStation 1300 Gigabit Dual Band Media Bridge isn't much to shout about. It takes the dull business styling from the rest of the range. For a bridge it's rather on the large side, being not much smaller than the full Buffalo AirStation 1750. Partly, you could put this down to the four for Gigbit LAN ports, which certainly get our thumbs up, and are a good step up from the Asus RT-N66U, which only has the one. They should also be necessary, because even a good 2.4GHz connection should max out a 100BaseT connection with its 12.5MB/s upper limit. To help ease connections, Buffalo routers feature an AOSS button, which stands for AirStation One-touch Secure System. If you're running an all Buffalo ecosystem then this does indeed make connecting to your chosen router a one-touch profess, even if that's actually one touch on each station. If you're not, then it will double as a WPS button. It's not necessary as such, but if you want to alter the configuration, such as disabling the AOSS mode or adjusting the WPS key, there is a web interface. On the bridge it's rather minimal, not offering much beyond the mentioned adjustments with logging and basic IP settings. But then it shouldn't need much. Additionally, there is a 5GHz front LED and rear button. This is down to the router only supporting separate 2.4GHz or 5GHz modes, with a long-press of the button switching between the two. We don't see this as a disadvantage for the bridge, since it's really a case of connecting to the best available frequency available. In this case it will be the 5GHz network. As we've mentioned, this is a three-antenna unit, so if you're running a 2.4GHz network it's capable of 450Mbps, as long as your router is capable of the same. The 450Mbps is also replicated at 5GHz when running in 802.11n mode. Obviously when an 802.11ac-capable router is available, this should open up a world of speed and 1.3Gbps transfers. We'll look at real-world performance next.